This company of great people is family oriented, insist on providing highest quality materials and service, maintains the highest level of integrity, and they truly care about people and their relationships with the fishing community and their customers. We will deal here with fishing from a boat so as you prepare to fish for Spanish there are a few things that you will need to have in hand. 1) A good Medium Light rod and reel. I use a 20 lbs class custom Rainshadow spinning rod with a Penn 5500 reel. You can go lighter if you want some really sporty actions but if a big Bull Red jumps on your gear, you will just have to say goodbye. 2. Spoons and Jigs. 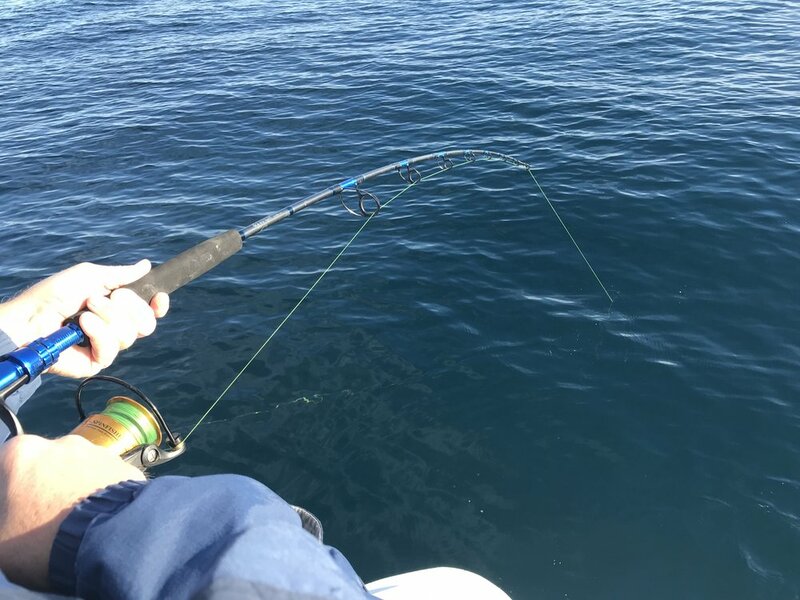 I use the typical 2 to 3-ounce small trolling weight, a "Mackerel Tree" with a Silver Horde spoon behind it, or just the spoon 4 feet behind the weight. Silver Horde Spoon are available locally at the Mexico Beach Marina Store. They will out fish a Clark spoon and will last a whole lot longer. One thing I always do with them is, once you open the package, increase the front and back bend a little. You want them to flutter. Repeat that re-bend each time you catch a fish or get a strike. I troll 4 rods. The 2 outside rods both have the "Tree" set ups on them and the 2 inside rods are rigged with just weights and spoons. When I drop my gear back I count seconds. The outside rods are 10 and 15 seconds back, while the 2 inside rods are 20 and 25 seconds back. I troll between 4 and 5 mph and when I get a hit I keep moving at the same speed for a few seconds before reducing to idle forward to reel in the fish. There are times where you will hook 2 or 3 fish on the same rig at the same time. This fishery is a blast, especially for kids. We normally freeze the smaller Spanish to use for bait later in the season and Smoke the larger ones. They are also good grilled the day you catch them. This is how I fish for Spanish Mackerel. You may have a favorite method that is different. If so and it is productive, Keep on doing it.